Stefan Kudelski's iconic Nagra—it records in his native Polish—today employs 2000 people under the umbrella of the publicly traded Kudelski Group as led by his son André Kudelski. This vertically integrated conglomerate of hi-tech companies based in Cheseaux-sur-Lausanne off Lac Leman in Switzerland is focused on data encryption and management (digital television, video on demand and broadband Internet); smart-card security access for people and vehicles; and pro and consumer high-end audio products. The audio division of the NagraVision SA subsidiary employs 35 people. This only begins to explain the vast interdepartmental engineering resources and associated financial scale of operations that NagraAudio enjoys to make it unique amongst hifi firms. For example, the Kudelski Group runs a cadre of code breakers to continually test the safety of its own encryption protocols written by another team. Code writing for audio purposes is child's play by comparison. It all began in 1951 with Stefan Kudelski's portable Nagra 1 open-reel recorder above (crank and cover removed). It revolutionized the realms of radio, television, cinema and news reportage during an era when recording equipment was hugely bulky and stationary. Not only was this miniaturization groundbreaking, so was the sonic performance. It became a dominant force in the creation of the world's archival sound banks. The founder's love of music and the recording arts remained the guiding light for the Nagra Audio division throughout. 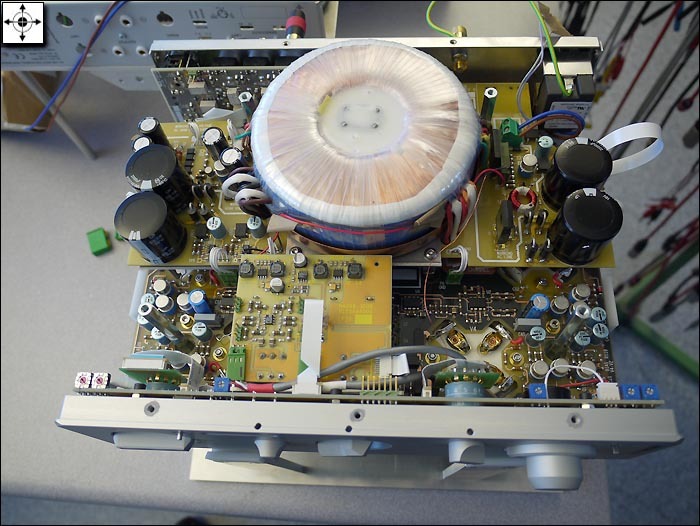 Since 1997, it has focused strongly on the enthusiast home market with the PL-L and PL-P vacuum tube preamps; the VPA tube monos; the MPA, PMA and PSA transistor amplifiers; a DAC and three CD players; and the SNST-R miniature recorder. A closer look at Nagra's forthcoming 20wpc 300B push/pull amplifier with MOSFET drivers and the just released MSA stereo/mono amplifier will serve as evidence on what distinguishes Nagra from other hifi companies today. 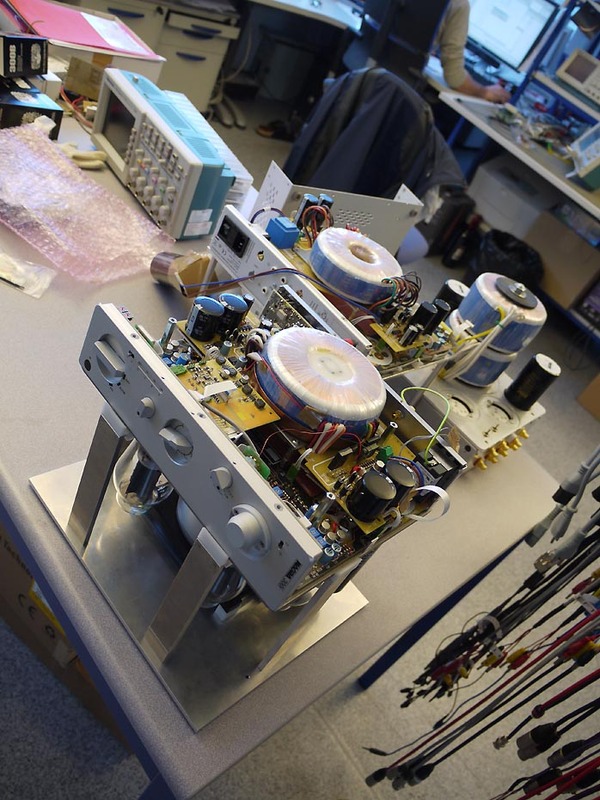 Development on the Nagra 300B dates back already two years. This firm doesn't rush to bring new things to market. 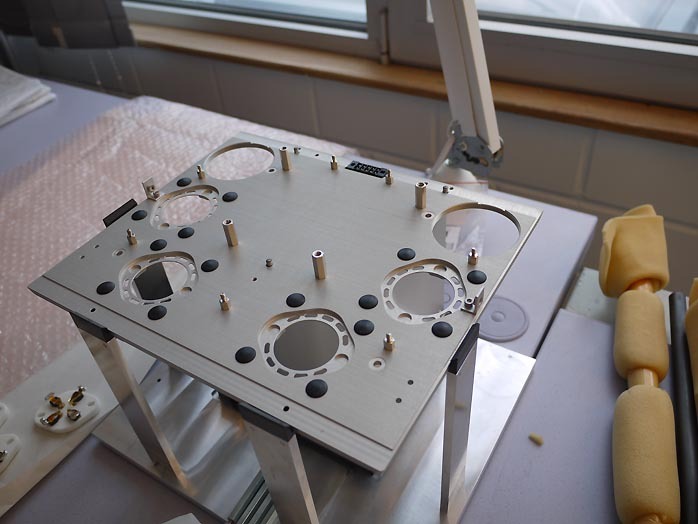 Here is a working prototype of the 300B belly up in the engineering department. 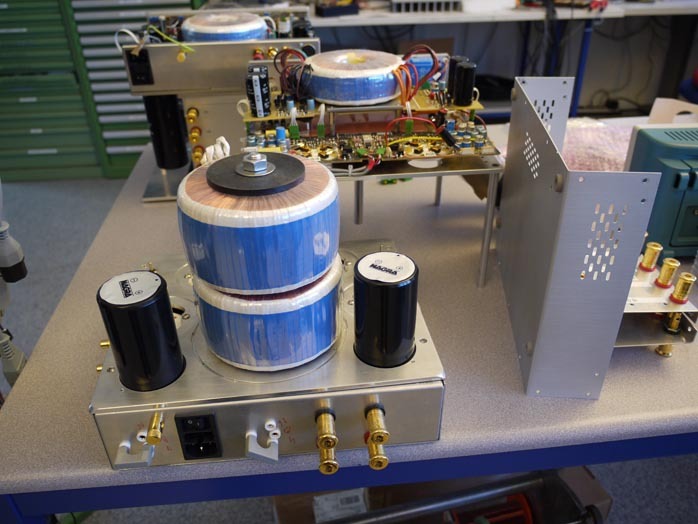 The oversized transformer stack is so top-heavy, the amplifier will ship with it removed. To avoid chassis damage in shipment, it'll be re-installed on the customer's or dealer's premises. 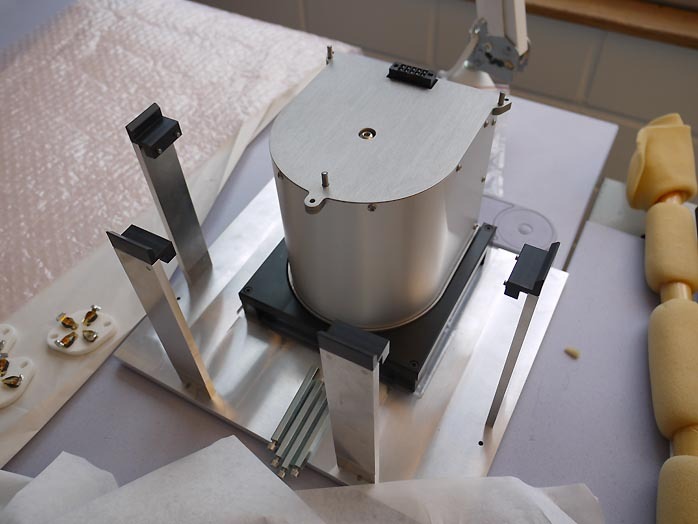 The output tap jumpers of the prototype above will become discrete binding posts in final production. 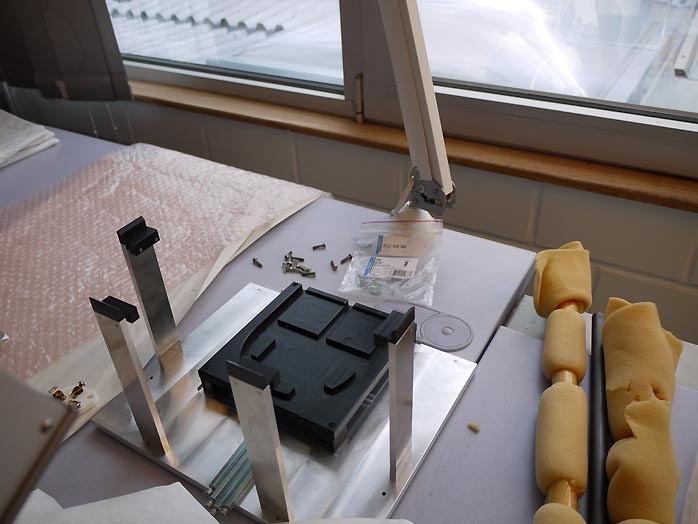 If these enigmatic photos have you wonder just how Nagra has solved the 'removable bits' challenge, what follows won't explain it but should assure us nonetheless that their engineers have everything under control. Where competitors employ 50-year old circuits with vintage point-to-point wiring, Nagra runs an 8-layer circuit board. 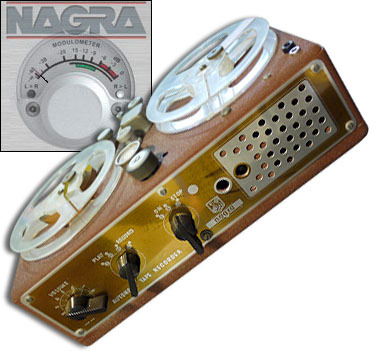 (Incidentally, Nagra was the very first Swiss company to implement SMD surface-mount technology. Sales & Marketing Director Matthieu Latour reminisced how Hewlett-Packard in those days paid a formal visit to check out what the Swiss were doing and how.) 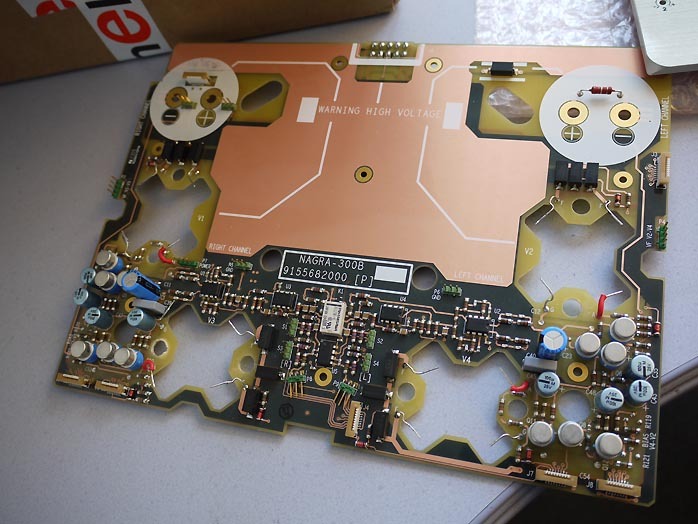 The board below may look innocuous enough until you watch the engineer responsible for its hidden micron layers flip through them on his computer screen.